Formed in 1997 by British singer and songwriter Steve Newman, his namesake band NEWMAN, have been releasing quality Melodic Metal ever since. Relying on calculated and thoughtful lyrics as well as irresistible hooks, NEWMAN bestows upon us a second “Decade” release, a follow-up to the previous one, ten years prior. Like “Decade,” “Decade “II” is also an ambitious undertaking, and like it’s predecessor is spread out over two discs. Both discs on “Decade II” feature 17 tracks, and clock in at over 75 minutes each. 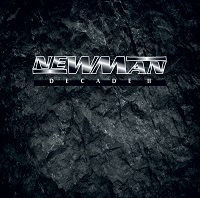 That’s a heck of a lot of music represented, and even more impressive when you consider NEWMAN has been able to release two volumes of this magnitude over the course of twenty years. Covering songs from 2007’s “Primitive Soul” through 2015’s “The Elegance Machine”, disc one also features tracks from the albums “The Art of Balance”, “Under Southern Skies” and “Siren”. Like it’s predecessor, these are newly performed and recorded versions, featuring the current lineup of NEWMAN, which is essentially the live band. Disc two highlights unreleased, B-sides, and songs written for other artists, as well as six songs from the “Aerial” sessions. Just a glance at the song titles should clue you in that NEWMAN’s niche is Melodic AOR songs themed on love and relationships, and it’s a niche that NEWMAN does extremely well. These songs are incredibly catchy, well done, and are all reminiscent of the mid eighties for me. They’re simple in the sense that they don’t rely on crazy technical runs, or progressive time changes. They don’t have to, rather the songs rely on their substance, and composition. That in and of itself is impressive and refreshing. Highlights for me from disc one were, “Hero to Zero”, “Ghost in the Night”, “The Elegance Machine” and “In Too Deep”. But the real standouts for me were “Primitive Soul” and “She Walks In Silence”. Disc two opens with “Breaking the Barrier” and immediately it’s a favorite, with it’s driving riff oriented guitar. “Fight No More” is a super power ballad with a soaring guitar solo, and perfect choruses. Great song, and one of my top picks from the collection. “Scar of Love” and “Never Becomes Again” are another pair of great riff based rockers that really showcase the entire band. I wasn’t even slightly familiar with NEWMAN before this review opportunity. So, in complete disclosure, though this isn’t necessarily the type of Metal I actively seek out these days, I came away impressed. Even more so for how prolific a songwriter and composer Steve Newman has been over the past 20 years and more. These songs reminded me of times when I was younger, and of simpler times. I really enjoyed listening to “Decade II”, and will likely seek out the first collection now as well.